I really had not planned to blog this marathon — I mean, I went into it as a “training run,” and how often do we really blog about training runs. (Ok, only if they are “Epic!”) Daily Mile, where I track everything religiously, is one thing, but on my blog? However, after reading so many reports the last few days, I’ve decided to go for it, but I think I’ll copy the best things from the a few other blogs instead of writing too much of my own. I will outline the plan of “training run.” First, I missed the original sign up date. Totally forgot about it. I saw all my running friends giving each congratulations and words of encouragement on making it in several hours after registration had closed. It must be a great thing for so many virtual high-fives, right?, but I had missed out. However, I heard about a 2nd chance registration, so I put that on my calendar with multiple alerts and alarms, so I wouldn’t forget again. Why did I want to run Umstead? Everyone seems to love it and have a blast. And I am trying to build some big base miles going into some big summer races, namely the Black Mountain Monster 24 hour run, which I ran last year, and Leadville, which still scares the heck out of me. My plan was simple. Take it easy. I debated on whether to wear an HRM or even a watch, but in the end decided to go with the HRM. I changed all the settings on my GPS to just show HRM and nothing else. I’d run the 1st hour (or two or three!) at sub 160, and then decide after that if I wanted to ease up or go a little harder. Little did I know…. So, keeping my HR < 160 on the hilly single track in the 1st 7 or 8 miles of the race proved difficult. Every hill, it would creep up and above, and my alert would go off. I walked a few to keep it down, but it was often still too high. Never above 165, but often in that 160-165 range on the steeps. But once we reached the bridle trails it was not too hard to keep under 160, though over time, it got hard to keep it over 150, and even 140 towards the end. I was literally falling apart! So anyway, back to my race. I struggled in the last 6 miles. And though this was supposed to be a training run, I found out just how hard Umstead really is. I do think I could run sub 4:00 here if I treated it like a big race, but it would hurt. A few days later though and my legs are fine — other than the right knee I tweaked the night of the race. I’m getting too old to jump around the living room screaming “We beat the Russians” at the end of Miracle on Ice, but it brings back fond memories of when I was 10 and was really into ice hockey. Especially 5 or 6 hours after running a marathon. Everything was perfect for a perfect race. The weather was beautiful, just on the tolerable side of cold. I was well rested, well trained, well fed, and well dressed. I carried two handheld squeezable flasks filled with Hammer Gel, providing easy access to fuel whenever I needed. If every there was a day to swing for the fences, this was it. Umstead, however, is like a well-trained boxer. It throws perfectly timed jabs and counters, hooks and straights. It sees your punches before you even think to throw them. Umstead might let you win a round or two, only because it’s easier to beat up someone who isn’t running away. You can either try to outsmart the course, or outfight the course. I chose fight, and started a-swingin before the bell stopped a-ringin. “If you’re gonna be stupid, you better be tough.” The now-immortal words of Ryan’s uncle pretty well sum up the whole Umstead Trail Marathon experience. Granted, he was emerging from surgery and anesthesia when he said it, but that’s fitting. A runner would have to be blazingly high on insurance-subsidized pharmaceuticals to fight the Internet just to get into Umstead and then pay money for it and then actually run the thing. It’s that hard, I swear to you. More importantly, even through all the physical suffering of the race, I come away loving Umstead Marathon more than ever. For me, it’s not about the finish time, or the incredibly difficult course, or even overcoming the inevitable challenges of the race. It’s about the experience as a whole. The joy on the faces of the first timers crossing the finish line. The smiles of the volunteers. The high fives with old friends. There’s a beautiful, natural fellowship that seems to spring from the stony ground of Umstead. A gift I hope to enjoy for many more years. As for me, I finished in 4:18. I had gone in thinking 4:30 for a training marathon would probably be about right, but allowing the HR to go to 160 vs. 150 or 155, I thought something near 4:00 might happen. Barring the drastic slow down in the last 6 miles, I probably would have been close to that. I’m pretty sure I’ll be back..
Nice write-up. But with the manpris under the kilt, you’re obviously no Scotsman! So from mile 12 to 14, is that really a 150 foot climb? Grueling I tell ya. 🙂 Does look like fun though. I should have pulled the tights when the temps went above 30, but I was being lazy. And like I said, it’s not like the hills are that big, they just never stop. After running Uhwarrie 4 weeks prior I didn’t think the hills were bad at all, but I was amazed at how many other runners were talking about them… I think a lot of Umstead runners are road runners…. First kilt, woo hoo! For a training run 4:18 is pretty good, especially in Umstead. 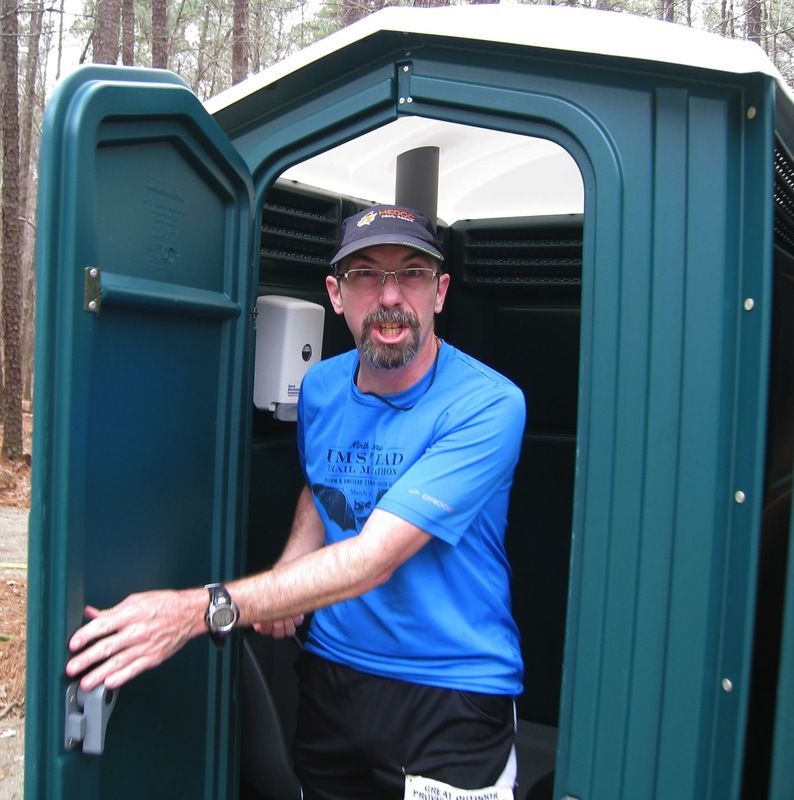 I’m sorry the image of the port-o-pot sprint is burned into your brain (and yes, use of the photo is absolutely fine). On the bright side, at least you didn’t catch the norovirus from me out on the trail. Just found your blog from der Scott’s link. 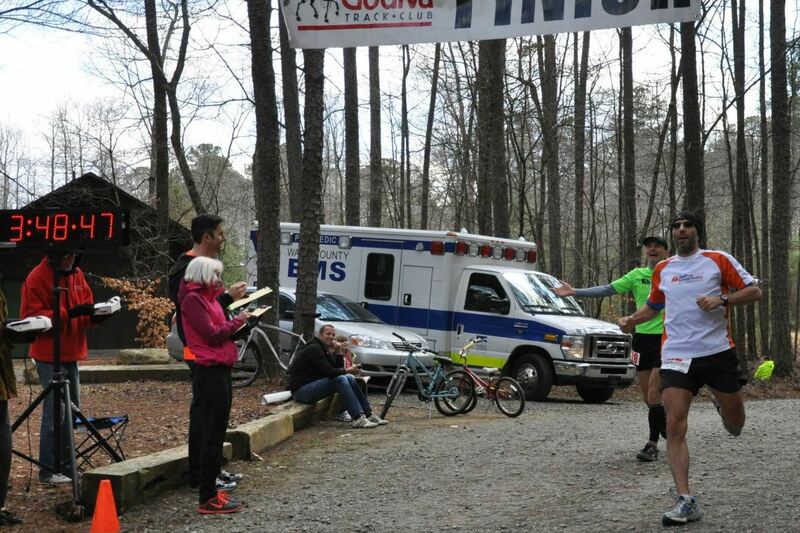 Your upcoming ultras and Umstead training run time makes you a likely bad @ss. Nice to see the kilt represented by fast people. I enjoyed your posts. Good luck on the upcomings. Definitely not a bad @ss! 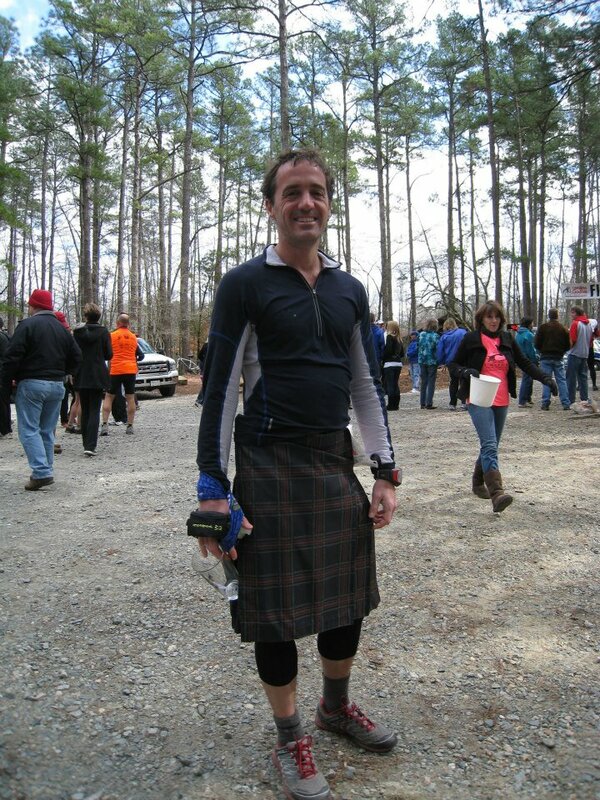 It was my 1st kilt run, but I look forward to more. If only I had been fast enough to make it to the big kilt run right after the marathon! I enjoyed your post over on running diatribe too!